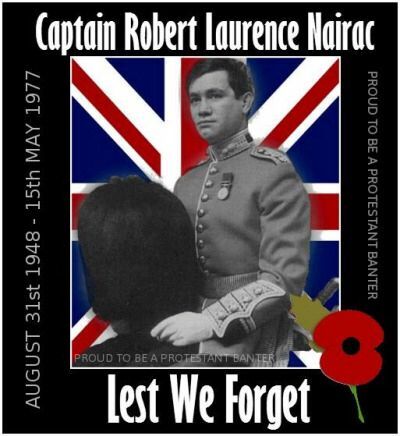 Captain Robert Laurence Nairac GC (31 August 1948 –15 May 1977) was a British Army officer who was abducted from a pub in Dromintee, south County Armagh, during an undercover operation and killed by the Provisional Irish Republican Army (IRA) on his fourth tour of duty in Northern Ireland as a Military Intelligence Liaison Officer. He was posthumously awarded the George Cross in 1979. A number of claims have been made about both Nairac’s involvement in the killing of an IRA member and his collusion with loyalist paramilitaries, although he was never charged. Whilst several men have been imprisoned for his death, the whereabouts of his body remains unknown. Nairac was born in Mauritius to English parents. His family – long settled in Gloucestershire – had ancestors from the south of Ireland. His family name originates from the Gironde area of France. His father was an eye surgeon who worked first in the north of England and then in Gloucester. He was the youngest of four children, with two sisters and a brother. Nairac, aged 10, attended prep school at Gilling Castle, a feeder school for the Roman Catholic public school Ampleforth College which he attended a year later. He gained nine O levels and three A levels, was head of his house and played rugby for the school. He became friends with the sons of Lord Killanin and went to stay with the family in Dublin and Spiddal in County Galway. He left Oxford in 1971 to enter Royal Military Academy Sandhurst under the sponsorship of the Grenadier Guards and was commissioned with them upon graduation. After Sandhurst he undertook post-graduate studies at the University of Dublin, before joining his regiment. Nairac has been described by former army colleagues as “a committed Roman Catholic” and as having “a strong Catholic belief”. Nairac’s first tour of duty in Northern Ireland was with No.1 Company, the Second Battalion of the Grenadier Guards. The Battalion was stationed in Belfast from 5 July 1973 to 31 October 1973. The Grenadiers were given responsibility first for the Protestant Shankill Road area and then the predominantly Catholic Ardoyne area. This was a time of high tension and regular contacts with paramilitaries. Ostensibly, the battalion’s two main objectives were to search for weapons and to find paramilitaries. Nairac was frequently involved in such activity on the streets of Belfast. He was also a volunteer in community relations activities in the Ardoyne sports club. The battalion’s tour was adjudged a success with 58 weapons, 9,000 rounds of ammunition and 693 lbs of explosive taken and 104 men jailed. The battalion took no casualties and had no occasion to shoot anyone. After his tour had ended he stayed on as liaison officer for the replacement battalion, the 1st Battalion of the Argyll and Sutherland Highlanders. The new battalion suffered a baptism of fire with Nairac narrowly avoiding death on their first patrol when a car bomb exploded on the Crumlin Road. Rather than returning to his battalion, which was due for rotation to Hong Kong, Nairac volunteered for military intelligence duties in Northern Ireland. Following completion of several training courses, he returned to Northern Ireland in 1974 attached to 4 Field Survey Troop, Royal Engineers, one of the three sub-units of a Special Duties unit known as 14 Intelligence Company (14 Int). Posted to South County Armagh, 4 Field Survey Troop was given the task of performing surveillance duties. Nairac was the liaison officer among the unit, the local British Army brigade, and the Royal Ulster Constabulary. Nairac finished his tour with 14th Int in mid-1975 and returned to his regiment in London. Nairac was promoted to captain on 4 September 1975. Following a rise in violence culminating in the Kingsmill massacre, British Army troop levels were increased and Nairac accepted a post again as a liaison officer back in Northern Ireland. Nairac on his fourth tour was a liaison officer to the units based at Bessbrook Mill. It was during this time that he was abducted and killed. On the evening of 14 May 1977, Nairac arrived at The Three Steps pub in Dromintee, South Armagh, by car, alone. He is said to have told regulars of the pub that his name was Danny McErlaine, a motor mechanic and member of the Official IRA from the republican Ardoyne area in north Belfast. The real McErlaine, on the run since 1974, was killed by the Provisional IRA in June 1978 after stealing arms from the organisation. Witnesses say that Nairac got up and sang a republican folk song “The Broad Black Brimmer” with the band who were playing that night. At around 11.45 p.m., he was abducted following a struggle in the pub’s car park and taken across the border into the Republic of Ireland to a field in the Ravensdale Woods in County Louth. Following a violent interrogation during which Nairac was allegedly punched, kicked, pistol-whipped and hit with a wooden post, he was shot dead. He did not admit to his true identity. Terry McCormick, one of Nairac’s abductors, posed as a priest in order to try to elicit information by way of Nairac’s confession. Nairac’s last words according to McCormick were: ‘Bless me Father, for I have sinned’. His disappearance sparked a huge search effort throughout Ireland. The hunt in Northern Ireland was led by Major H. Jones, who as a colonel in the Parachute Regiment was to be awarded a posthumous Victoria Cross in the Falklands War. Jones was Brigade Major at HQ 3rd Infantry Brigade. Nairac and Jones had become friends and would sometimes go to the Jones household for supper. After a four-day search, the Garda Síochána confirmed to the Royal Ulster Constabulary that they had reliable evidence of Nairac’s killing. An edition of Spotlight broadcast on 19 June 2007, claimed that his body was not destroyed in a meat grinder, as alleged by an unnamed IRA source. McCormick, who has been on the run in the United States for thirty years because of his involvement in the killing (including being the first to attack Nairac in the car park), was told by a senior IRA commander that it was buried on farmland, unearthed by animals, and reburied elsewhere. The location of the body’s resting place remains a mystery. Nairac is one of nine IRA victims, whose graves have never been revealed and who are collectively known as ‘The Disappeared’. The cases are under review by the Independent Commission for the Location of Victims’ Remains. In May 2000 allegations were made claiming that Nairac had married, and fathered a child with a woman named Nel Lister, also known as Oonagh Flynn or Oonagh Lister. In 2001, her son sought DNA testing himself and revealed the allegations to be a hoax. The second statement was made at Dundalk police station after Townson had consulted a solicitor. He had become hysterical and distressed and screamed a confession to the officer in charge of the investigation. Townson was convicted in Dublin’s Special Criminal Court of Nairac’s murder and sentenced to life imprisonment. He served 13 years in prison and was released in 1990. He was part of Conor Murphy‘s 1998 election campaign team and as of 2000 he was living in St. Moninna Park, in Meigh. In 1978, the RUC arrested five men from the South Armagh area. Three of them – Gerard Fearon, 21, Thomas Morgan, 18, and Daniel O’Rourke, 33 -were charged with Nairac’s murder. Michael McCoy, 20, was charged with kidnapping, and Owen Rocks, 22, was accused of withholding information. Fearon and Morgan were convicted of Nairac’s murder. O’Rourke was acquitted but found guilty of manslaughter and jailed for ten years. McCoy was jailed for five years and Rocks for two. Morgan died in a road accident in 1987, a year after his release. O’Rourke became a prominent Sinn Féin member in Drumintee. Two other men, Terry McCormick and Pat Maguire, wanted in connection with this incident remain on the run. Maguire has been reported as living in New Jersey in the US. Kevin Crilly, 59, from Lower Foughill Road, Jonesborough, Co Armagh, is already facing charges of kidnapping and falsely imprisoning the 29-year-old Grenadier Guardsman near the Irish border in 1977. The captain, originally from Gloucestershire, was interrogated, tortured and then shot dead by the IRA after being snatched from a pub car park near Jonesborough and driven to a field at Ravensdale, Co Louth. His body has never been found. Prosecutors laid the murder charge before Crilly as he appeared at Newry Magistrates’ Court for a routine bail hearing on the two lesser counts, with which he was charged last year. District Judge Austin Kennedy granted Crilly bail; however, he ordered him to remain in custody after Crown lawyers indicated that they may seek to appeal against the decision in the High Court in Belfast. In the years after Capt Nairac’s disappearance, three men were convicted of his murder, but police have always said they were looking for more suspects. 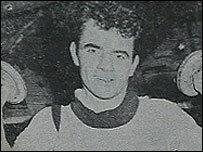 Crilly was interviewed by detectives in the weeks after the incident but left for the United States before officers could arrest him on suspicion of murder. Judge Kennedy was told today that the suspect had remained in the US for almost 30 years. Investigating officer Detective Sergeant Barry Graham said that, when he returned, he took another name, explaining that Crilly was adopted as a child and had assumed his birth name of Declan Parr. “The only reason he returned to Northern Ireland was because he was in a long-term relationship in America and that relationship had broken down,” he said. The officer told the judge that he could connect Crilly with the murder charge and the two other counts of kidnapping and false imprisonment. Crilly, dressed in a black leather jacket, white check shirt and blue jeans, spoke only to acknowledge that he understood the charges that he was facing. Noting that Crilly had complied with all bail requirements since his original arrest 18 months ago and pointing out that, at that point, the defendant was aware that the Public Prosecution Service was examining whether there were grounds for charging him with murder, Judge Kennedy rejected the prosecution objection to bail. The magistrate said any appeal against his decision would have to be lodged within two hours. He ordered that Crilly was held in the cells until the PPS signalled its intentions. On 20 May 2008, 57-year-old IRA veteran Kevin Crilly of Jonesborough, County Armagh, was arrested at his home by officers of the Police Service of Northern Ireland (PSNI). He had been on the run in the United States but had returned to Northern Ireland under an alias after the 1998 Belfast Agreement. He was charged the following day with the kidnapping and false imprisonment of Nairac. 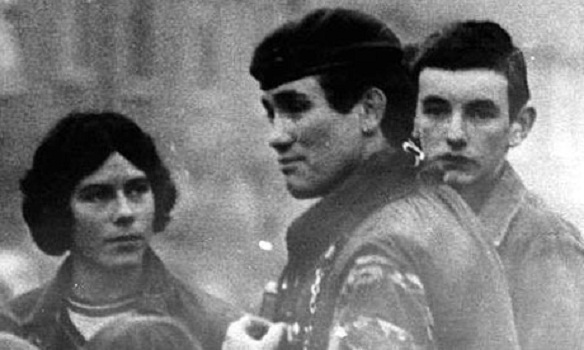 In November 2009, Crilly was also charged with the murder of Robert Nairac at Newry magistrates’ court during a bail hearing on the two counts on which he had been charged in 2008. Crilly was cleared on all counts in April 2011 as the Judge considered that the prosecution failed to prove intention or prior knowledge on the part of Crilly. Nairac’s killing is one of those under investigation by the PSNI’s Historical Enquiries Team (HET). On 13 February 1979 Nairac was posthumously awarded the George Cross. “ […]On his fourth tour Captain Nairac was a Liaison Officer at Headquarters 3 Infantry Brigade. His task was connected with surveillance operations. On the night of 14/15 May 1977 Captain Nairac was abducted from a village in South Armagh by at least seven men. Despite his fierce resistance he was overpowered and taken across the border into the nearby Republic of Ireland where he was subjected to a succession of exceptionally savage assaults in an attempt to extract information which would have put other lives and future operations at serious risk. These efforts to break Captain Nairac’s will failed entirely. Weakened as he was in strength – though not in spirit – by the brutality, he yet made repeated and spirited attempts to escape, but on each occasion was eventually overpowered by the weight of the numbers against him. After several hours in the hands of his captors Captain Nairac was callously murdered by a gunman of the Provisional Irish Republican Army who had been summoned to the scene. His assassin subsequently said ‘He never told us anything’. 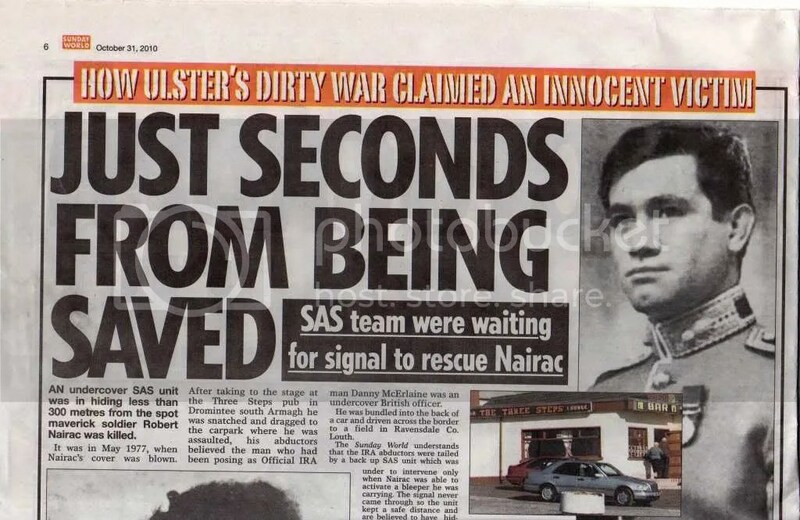 Claims have been made abouts Nairac’s involvement in the killing of an IRA member in the Republic of Ireland and his relationship with Ulster loyalist paramilitaries. It was alleged by a former Secret Intelligence Service operative, Captain Fred Holroyd, that Nairac admitted involvement in the assassination of IRA member John Francis Green on 10 January 1975 to him. Holroyd claimed in a New Statesman article written by Duncan Campbell that Nairac had boasted about Green’s death and showed him a colour Polaroid photograph of Green’s corpse taken directly after his assassination. These claims were given prominence when, in 1987, Ken Livingstone MP told the House of Commons that Nairac was quite likely to have been the person who organised the killing of three Miami Showband musicians. The evidence before the Inquiry that the polaroid photograph allegedly taken by the killers after the murder was actually taken by a Garda officer on the following morning seriously undermines the evidence that Nairac himself had been involved in the shooting. The picture derived from this is of a man increasingly frustrated with the failure of the British Authorities to take his claims seriously; who saw the threat to reveal a crossborder SAS assassination as perhaps his only remaining weapon in the fight to secure a proper review of his own case. His allegations concerning Nairac must be read with that in mind. In addition, “Surviving Miami Showband members Steve Travers and Des McAlee testified in court that an Army officer with a crisp English accent oversaw the Miami attack” (see Miami Showband killings), the implication being that this was Nairac. Fred Holroyd and John Weir also linked Nairac to the Green and Miami Showband killings. Martin Dillon, however, in his book The Dirty War maintained that Nairac was not involved in either attack. Colin Wallace, in describing Nairac as a Military Intelligence Liaison Officer (MILO) said “his duties did not involve agent handling”. Nevertheless, Nairac “seems to have had close links with the Mid-Ulster UVF, including Robin Jackson and Harris Boyle”. According to Wallace, “he could not have carried out this open association without official approval, because otherwise he would have been transferred immediately from Northern Ireland”  Wallace wrote in 1975; Nairac was on his fourth tour of duty in 1977. 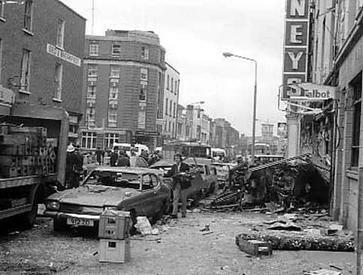 Robin Jackson was implicated in the Dublin and Monaghan bombings of May 1974, and Harris Boyle was blown up by his own bomb during the Miami Showband massacre. The Barron Inquiry found a chain of ballistic history linking weapons and killings under the control of a group of UVF and security force members, including RUC Special Patrol Group members John Weir and Billy McCaughey, that is connected to those alleged to have carried out the bombings. This group was known as the “Glenanne gang“. Incidents they were responsible for “included, in 1975, three murders at Donnelly’s bar in Silverbridge, the murders of two men at a fake Ulster Defence Regiment checkpoint, the murder of IRA man John Francis Green in the Republic, the murders of members of the Miami showband and the murder of Dorothy Trainor in Portadown in 1976, they included the murders of three members of the Reavey family, and the attack on the Rock Bar in Tassagh.” According to Weir, members of the gang began to suspect that Nairac was playing republican and loyalist paramilitaries off against each other, by feeding them information about murders carried out by the “other side” with the intention of “provoking revenge attacks”. The Pat Finucane Centre stated when investigating allegations of collusion between the security forces and loyalist paramilitaries, that although Nairac has been linked to many attacks, “caution has to be taken when dealing with Nairac as attacks are sometimes attributed to him purely because of his reputation”.